The Indian markets presently seem to be in a consolidation mode, and the correction has been accentuated by various macro challenges like elevated crude oil prices, rupee depreciation versus the dollar and the recent credit and liquidity crunch due to default by a major infrastructure lender. Global risk aversion — led by rising interest rates in the developed markets and trade wars — has further led to a sell-off in emerging and Asian markets. 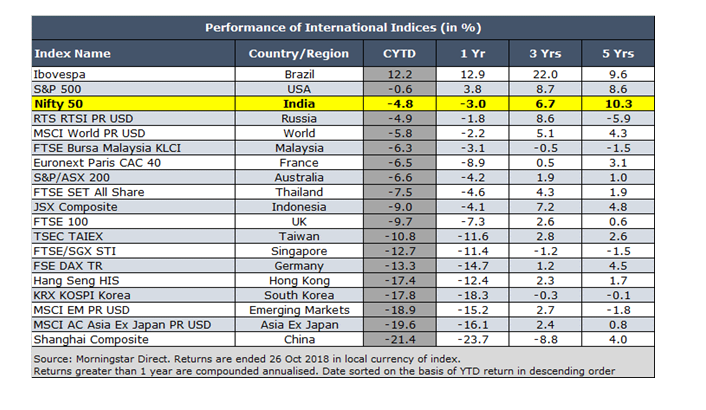 If you see year-to-date (YTD) returns of various global markets, you will notice that the correction has been across the board and India has relatively outperformed most of its peers. The benchmark Shanghai Composite index in China has been one of the bottom performers this year and lost more than 20 percent. The MSCI Emerging Markets index and MSCI Asia excluding Japan index have both lost around 19-20 percent this year. Developed markets have done relatively better, with the MSCI World index down around 5 percent, and within that the US has been one of the top performing markets YTD. The Nifty has fallen relatively less (by 4-5 percent YTD). Over the long term (5 years), it is still among the top performing global markets. Even though the Nifty is down marginally YTD, the Nifty Midcap 100 and Nifty Smallcap 100 indices have seen a much deeper correction, down around 23 percent and 37 percent, respectively, over the same period. As a result of the correction in broader markets, valuations in the small and midcap space and their premium to the Nifty have fallen significantly. 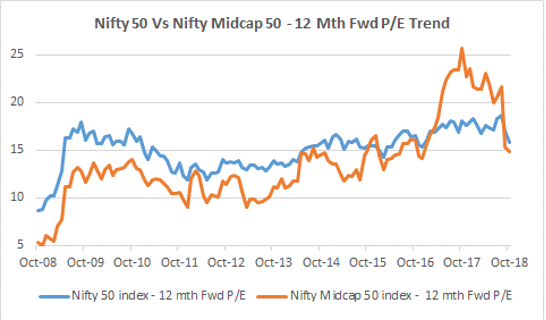 The chart below shows that the one-year forward price-to-earnings ratio of the Nifty Midcap 50 index has come down significantly and is now close to that of the Nifty after a long time. Although, we still prefer largecaps from a risk-reward perspective, the deep correction in the mid/smallcap space (particularly quality stocks) is starting to present select value. 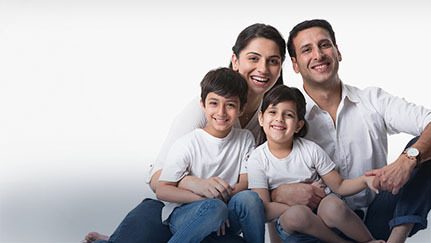 Long term investors can consider partial allocation at this juncture. Even though we are facing some challenges, we are in a relatively better position on most macro parameters than in 2013 (during the Fed taper tantrum), which had also caused risk aversion and foreign outflows from emerging markets. The rupee was one of the bottom performing currencies in 2013 and had fallen by more than 20 percent at one point intra-year as against the 13 percent fall in 2018 till date. Current account deficit (CAD) is expected to be 2.8-3 percent of GDP in FY19 versus 4.8 percent in FY13. Similarly, fiscal deficit is expected to be 3.3– 3.5 percent of GDP versus around 5 percent in FY13. Brent crude prices averaged $110/barrel in FY13. In October, it was around the $78 mark. Consumer headline inflation was at average 9.8 percent in FY13 and is expected to remain around 4.5 percent in FY19. GDP growth was at a modest 5.5 percent in FY13 and is forecast around 7.4 percent in FY19. Our forex reserves are also significantly higher than that in 2013. Another advice to investors is not to panic amid the current correction in markets and carry on investing systematically. Let us assume an investor started an SIP investment during the earlier market cycle peak at the end of December 2007. 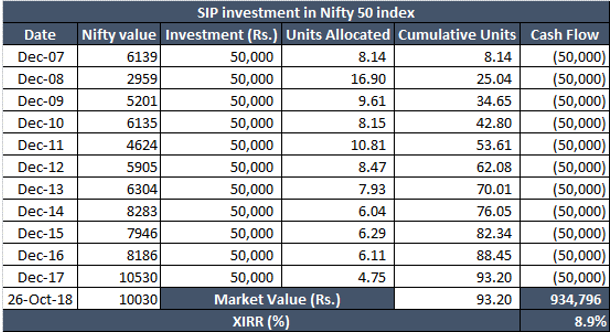 Despite the sharp fall in 2008, if the investor continued with the SIP, then the portfolio would have managed to deliver an internal rate of return (XIRR) of almost 9 percent as of today by just investing in the Nifty. The investor’s systematic investment of Rs 50,000 per annum (cumulative investment of Rs 5.5 lakh) would be worth around Rs 9.35 lakh currently. A typical largecap fund or unit linked insurance policy has meanwhile managed to return an alpha (additional return over Nifty) of 3-4 percent CAGR over a 10 year period (Source: Morningstar). However, if the investor had made a lumpsum investment of Rs 5.5 lakh in the Nifty in December 2007, then the portfolio would have returned only 4.6 percent CAGR, with the investment being currently worth Rs 8.99 lakh (lower than that through the SIP mode). The recent market correction provides an interesting buy-on-dips opportunity for long term investors, especially those who are underweight equities in their portfolio. Some of the factors (mentioned earlier), which prompted the market correction, have somewhat stabilised now — with crude coming off from its recent highs, rupee stabilising and regulatory actions being taken to ease the credit and liquidity crunch. We feel a large part of the correction maybe already in the price. However, some uncertainty will remain in the markets on account of the impending general elections in India and global factors like monetary tightening by the US Federal Reserve, ongoing trade wars and uncertainty in crude prices, which could put some further pressure on the market in the short term. However, valuations have become more reasonable with the recent correction. India’s long term growth story still remains intact and is better poised than some of its emerging market peers. GDP growth is picking up and India is projected to be one of the fastest growing major economies over the next year. Corporate earnings growth is also recovering after a long hiatus, and that will be the driving force for the market going forward.